« The Wack is Back! 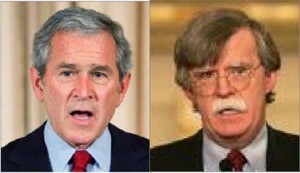 George Walker Bush and John Robert Bolton II are peas in a pod. 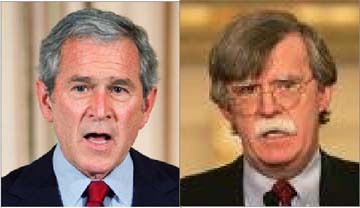 However you want to slice it, dice it or describe it, they did not tell the truth in the period leading up to the Iraq War. That said, why would we put any faith in anything that they said? This is the sad truth about the Bush Administration, and one reason why I support former prosecutor Vincent Bugliosi’s efforts to secure an indictment by a district attorney or attorney general regarding the crimes committed in our name. If it were Barack Hussein Obama in his place, I’d advocate the same. Because those who fail to heed the lessons of history are doomed to repeat them. In this case, the lesson would be “we can do anything or say anything we want, because the Congress doesn’t have the stones to impeach, and the next administration won’t have the stones to investigate. That’s a lesson we don’t want to pass on, because no administration, no government official should be allowed to LIE to the American public or LIE to the Congress or DISTORT the truth in matters of policy, particularly when they involve the lives of American servicemen, or the lives – physical or financial – of average American citizens. To do so not only emboldens future elected officials to go down that path, it also empowers their supporters to do likewise; because the lie, repeated often enough, becomes the truth. We’re seeing this in the healthcare reform debate. The special interests and the ideologues who oppose changes in our healthcare system, particularly providing expanded public options, are willing to say and do anything to head off progress. The stakes are huge: our nation spends more and gets less for its money than does any industrialized nation in the world, most of which have either government health programs or government insurance coupled to private providers. The fearmongers and hatemongers are out in force. It’s up to the real majority in this nation – the ones who believe that healthcare must be reformed and that a viable public option is the only way to keep private providers honest – to hold Congress and the administration accountable. We have got to empower them to do whatever it takes to get that first foothold. It can’t be any deal: it’s got to include at least two things: a viable public option, and an expansion of coverage that includes almost if not all of the uninsured. It should also provide for portability, so that people aren’t trapped in dead-end jobs because of benefits. Wednesday will be a real test for Pres. Obama and this Democratic Congress. Take this opportunity to contact your representatives, and the White House, and voice your opinions. If you don’t believe how important this is, just know that there are services pandering to the Right that will, for a fee, do just that in opposition to healthcare reform. The Right Wing learned long ago that fear sells, and they’ve found a ready audience that’s willing to pay them to send messages, to bus in protestors, to create commercials that fabricate “truth” to achieve their obstructionist goals. With your help, we’ll carry the day. May the Higher Power of your choice spur you to action and guide your message to the target. This entry was posted on Saturday, September 5th, 2009 at 1:57 pm	and is filed under Uncategorized. You can follow any responses to this entry through the RSS 2.0 feed. You can leave a response, or trackback from your own site.